The stage was set and everyone was anxious on the eve of the big day. While the people working towards the preparations had toiled hard and made every effort to make the process smooth, they knew that as soon as the step was announced, various factors would send all the preparations into haywire. And so they stepped out of their homes on November 8th, 2016, ready to face the unchartered territories. The entire machinery worked in close coordination on the day and everyone was anxious while managing each step cautiously and carefully. During the day, the notification had to printed and final draft of Prime Minister's speech had to be readied. The government needed a very reliable press to have these two printed with an adequate number of copies. They resorted to the press used to print budget every year as its reliability has been time tested (read more about how the budget is printed at Annual Union Budget – India's Earning & Expenses). Notification was printed and stored securely to be released immediately after the announcement. In the preparations towards the announcement, time was sought by various media outlets to carry out the PM's speech live so that it reached maximum population and it was officially made to be an "Address to the Nation" on critical issues facing the country. As the news of the address was bound to leak out, a backdrop was prepared and showcased to divert the public speculation. All the three chiefs of military branches were summoned in the PMO and a long discussion ensued. Scripts were leaked to media indicating that the content of the address would relate to India's defenses and terrorism. The moment was ripe with rising tensions with Pakistan and everyone was convinced that the announcement was related to some military conflict with our neighbor and media channels rushed to run predictions around the theme. No one knew that it was a different type of terror that the government was targeting. Next, a meeting of the Board of Governors of RBI was called at the central bank. Constitutionally, RBI is the authority on monetary matters and they had to initiate the official process towards demonetization. While two of the 7 member board were unavailable, the quorum was reached and a resolution was passed after committing them to confidentiality. While officially it was a necessity, there was not even a single voice of dissent among the board members and the resolution was passed and the central government was notified that the formality from the end of the RBI was complete. This happened something around 6:30 in the evening. However, the official process before the announcement was far from over. The government needed approval from the cabinet and the select group had their own apprehensions about leakage, even from that elite group of persons who formed the Union Cabinet. The PM did not risk trusting even his ministerial colleagues with something this big. Hence, a few weeks ago, the Cabinet Secretariat issued instructions that the members of Cabinet would not be allowed to carry cellphones to the Cabinet meetings. 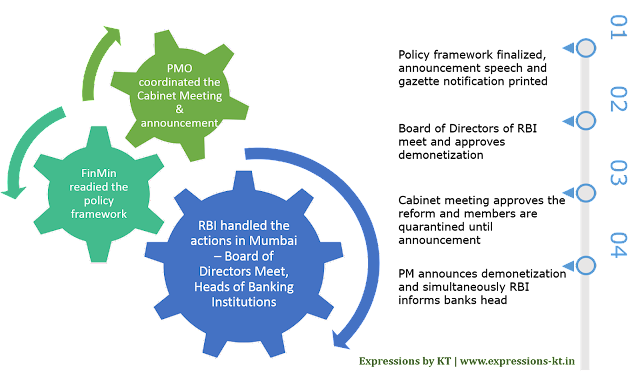 The Cabinet meeting was called at about 7 PM to discuss various MOUs between India and Japan, moments after the confirmation from RBI was received. The Finance Minister, Arun Jaitley briefed the Cabinet about the impending announcement and various aspects of demonetization. A short overview of government's preparation and happenings until then was provided to allay fears of some of the members. The Home Minister was also asked to prepare for the aftermath and think on how to handle things post announcement. By 7:30 in the evening, Cabinet had stamped its approval and gave its go-ahead for the PM to make the public announcement. Cabinet members were instructed to stay quarantined in the Cabinet room until the PM made the announcement. About 2000 kilometers away from this was an eventful evening at the RBI headquarters in posh Mumbai locality. RBI had called in heads of all the leading banks of the country for a meeting on steps to deal with non-performing assets. The invite to the bank heads was rather vague and many in the banking sector wondered as the invites from RBI were always well defined along with agenda so that bank representatives were prepared for a fruitful discussion. This was different and we now know for obvious reasons. Anyway, they had to be there on time as no bank could afford to ignore an invite from RBI. All the who's who of the banking world were there in the conference room of the RBI by quarter past 7 in the evening. Officials from the RBI received the representatives and began a discussion around various issues facing the banking sector. Prime Minister Narendra Modi made his way to the media room where the team from Doordarshan, the official broadcaster was ready to carry the announcement live which was to be simultaneously picked by all media outlets. 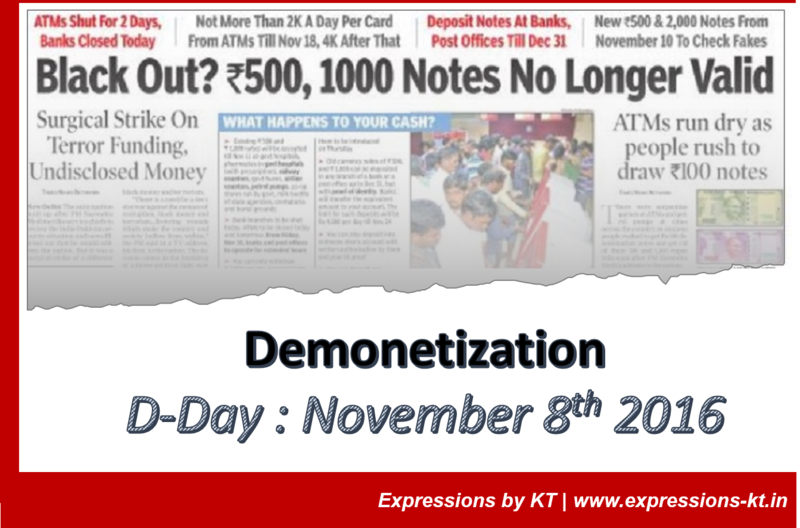 The part of demonetization in eyes of public started with a 40-minute long speech where the Prime Minister Narendra Modi announced the demonetization of existing notes of Rs 500 and Rs 1000 during a televised address to the nation on the evening of Tuesday - November 8th, 2016. This was the same time when everyone was glued to the screens to follow the results of US Presidential elections. The PM announced that the bills of said denomination will cease to be legal tender from the coming midnight and would be "just worthless pieces of paper." There was a limited relief for use of old currency at specific outlets offering emergent services - travel, hospitals, medicines, fuel and government departments. The speech was carried live by all the news networks and it definitely took a few moments for everyone to realize what actually had happened. People were dumbstruck for minutes as the announcement sunk in and its implications realized. However, the government machinery did not have that luxury of time to grasp the news. Home Minister, Rajnath Singh, activated his ministry and the Home Secretary started ringing the Chief Secretary of each state to let them know about the announcement and advise them to arrange for potential law and order implications. For starters, bank branches would need additional security both for securing additional money supply and managing the rush of public. Further, home ministry was asked to provide security during movement of cash and also provide support to finance ministry in responding to eventualities. The finance ministry on its part alerted the Enforcement Directorate and Income Tax Department that they should be on their toes through the process. The Financial Intelligence wing was asked to track all deposits and identify potential cases of fraud and irregularities. This is the story until November 8th, 2016, the day before the big announcement. The team was ready with its preparations and protocols to respond to unforeseen situations. The anxiety was at all time high levels as the stakes were high. It would only be history that would judge the actions of the Prime Minister and his trusted team based on how things pan out. The next part of the article brings about the life after the announcement and what has all this achieved.